When we first arrived in Bangkok on our quest for authentic food, exploring Bangkok Chinatown was high on our list. 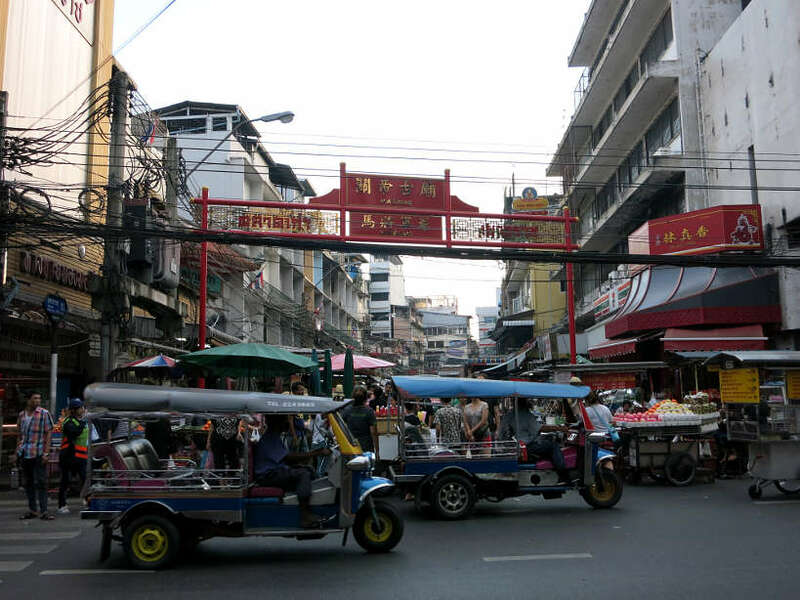 In addition to being one of the world’s largest and most authentic Chinese communities outside China, Chinatown Bangkok is also one of the capital’s busiest and liveliest districts. Known to locals as “Yaowarat”, Chinatown Bangkok goes way beyond a tourist attraction. It is a working Chinatown with two distinct atmospheres. The Chinatown Bangkok market by day and a massive open air food market by night. So the question became, how do you find amazing Chinatown Bangkok food in one of the busiest districts of Bangkok? Bangkok’s Chinatown is vibrant and engages all senses. During the day, Chinatown is bustling with stores, shophouses and street vendors. 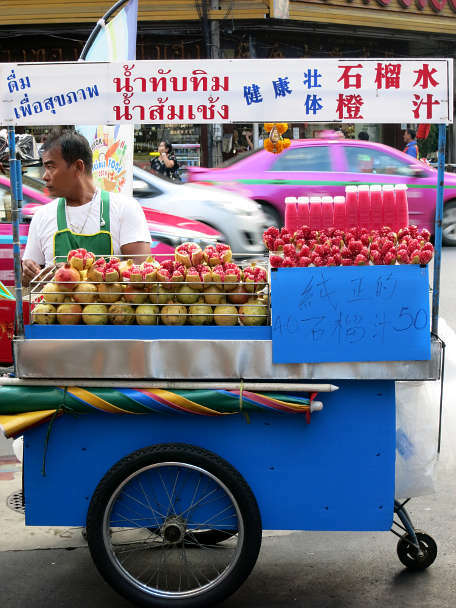 You see food vendors selling produces, Thai desserts, fruits and juices. Many stores and shophouses loudly display their wares, everything from gold, clothing to Chinese medicinal products. When night falls, street food vendors come out to light up Chinatown’s sidewalks and dark alleys. Hundreds of food stalls tempt and invite you with delicious smells from their cooking pans. Sizzling woks, chopping boards and the sights of cooking flames will compete for your attention. To guide us through Chinatown, Ren from Context Travel was our guide. We had taken a Paris Chocolate tour with Context Travel previously and loved learning about the history of chocolates in Paris. 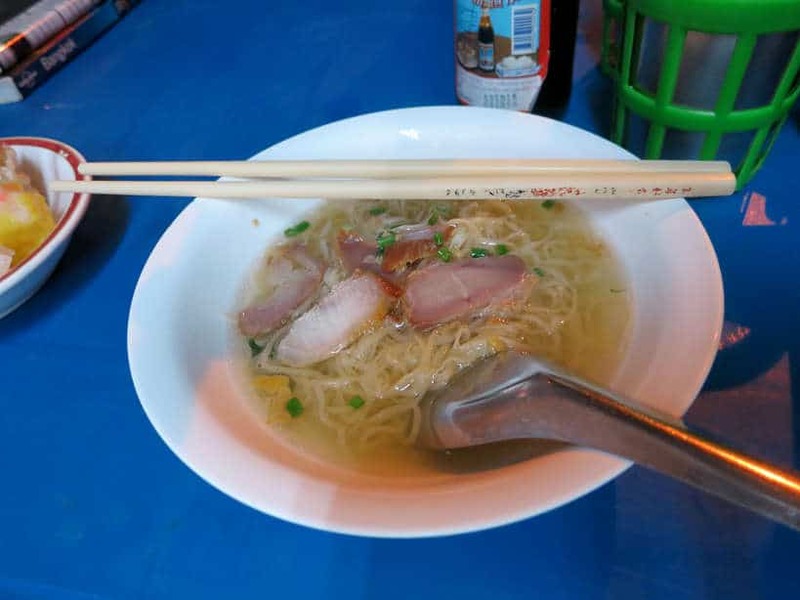 When we found out that Context offers tours in Bangkok Chinatown, we jumped at the opportunity to explore Chinatown Bangkok food. Our tour through Bangkok’s Chinatown started at 4:30pm which gave us a chance to see Chinatown by day and by night. We meandered through small and narrow alleys making our way through Itsara Nuthap alley on Soi 6, one of the Bangkok food markets within Yaowarat. 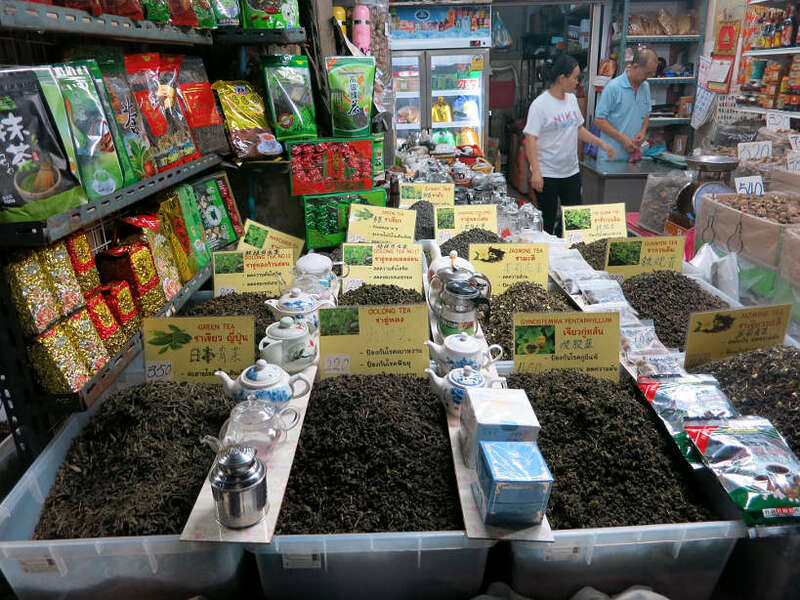 As we navigated our way around Chinatown Bangkok market, we were assaulted by a variety of interesting smells. From durian at corners stalls, flowery scents of Chinese teas, to ducks hanging upside down like prized trophies. 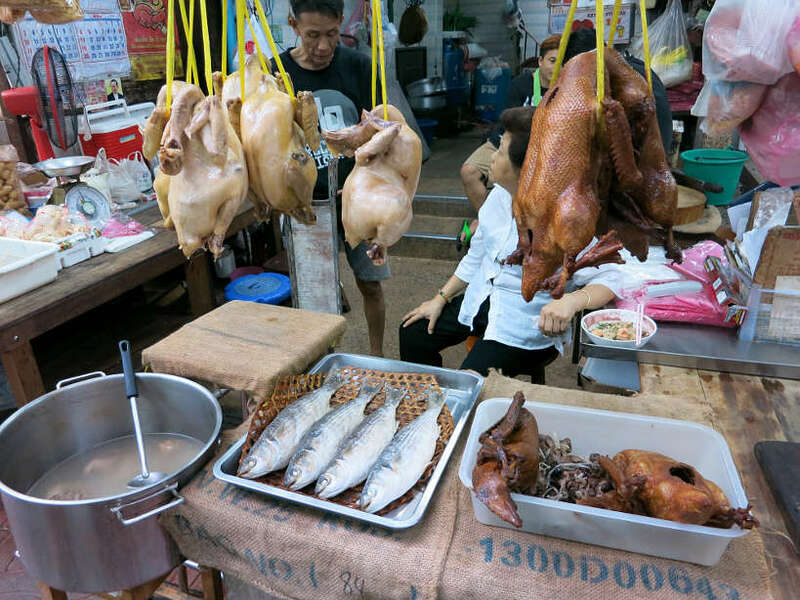 Chinatown food vendor with ducks hanging upside down like prized trophies! 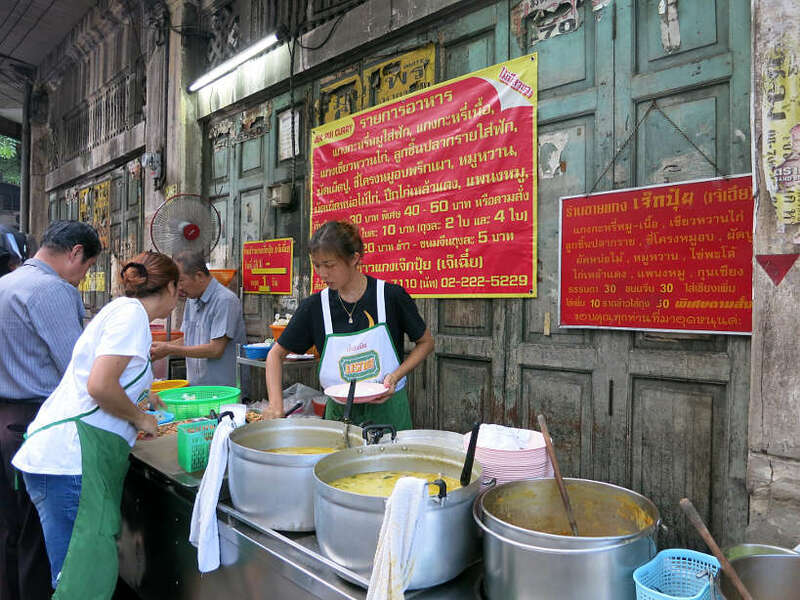 After strolling through the market, we ended up at Charoen Krung Road, a few steps away from the famous Khao Gaeng Jake Puey Curry. 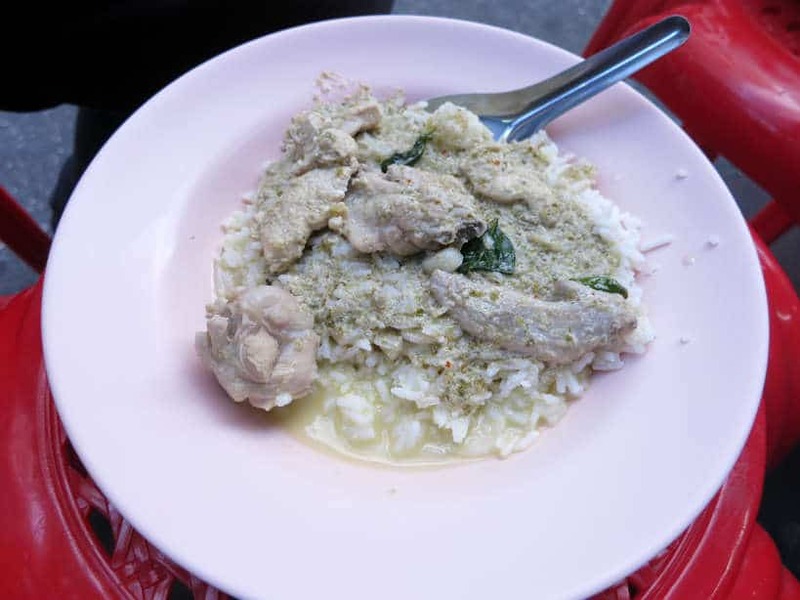 Khao Gaeng Jake Puey Curry also goes by Jek Pui Curry. This large food stall is located on the sidewalk of a busy street. Though it is an unlikely location for a food stall, the curry simmering in large pots and art deco background makes it quite intriguing. Get yourself tempted by the pork or chicken curry. We couldn’t pick one, so we had a chance to try both. Be aware that the place is very popular with locals, especially office workers at the end of the day. One of the first things you will notice is that there are no tables at Jek Pui Curry because of the lack of room and the popularity of the place. Once you place your order, you simply pull up a little plastic stool on the sidewalk and wait for your order to come. With no tables, you eat your meal holding your plate in your hands. This family-owned 70+ year establishment is well worth the experience. Our delicious curries and rice were very flavorful and not too spicy. 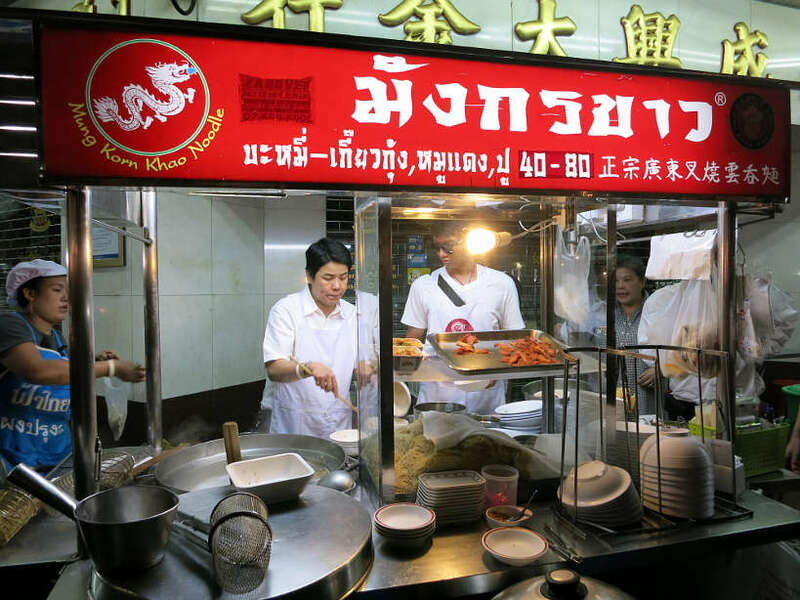 This is one of our favorite street food stalls in Bangkok Chinatown. Address: 427 Mangkon Rd, Bangkok. Hours: 4:00 pm to 9:00 pm. Closed on Monday. We strolled along Charoen Krung Road until we reached Phlap Phla Chai Street and then turned left. 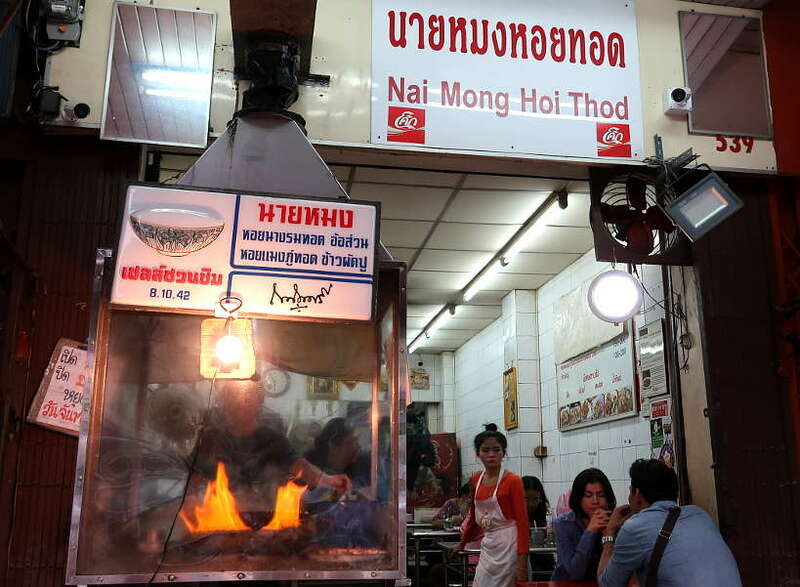 About 50 meters on the right hand side, we stopped at Nai Mong Hoi Thod, famous for their crispy Thai oyster omelet! 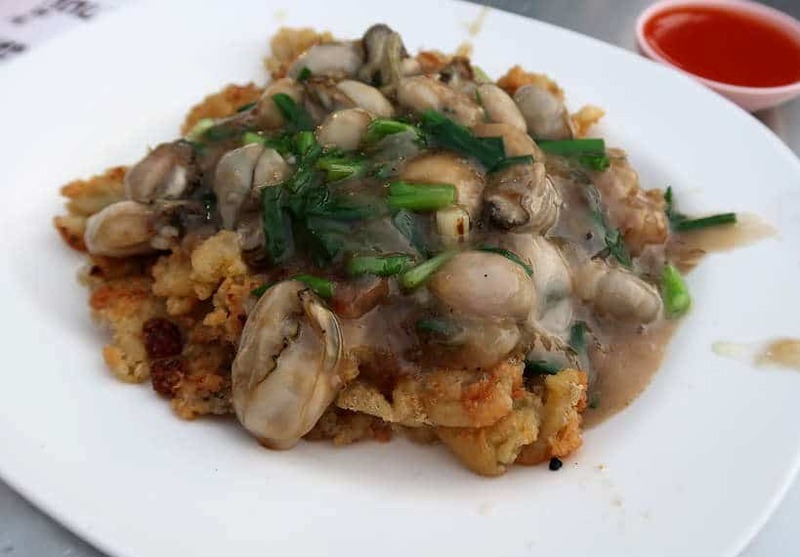 This Thai oyster omelet is also known as Hoy Tod. It is a dish brought by Chinese immigrants revisited ‘the Thai way’. At Nai Mong Hoi Thod, a shop-house style restaurant, they specialize in making only this dish with either oyster or mussels. The omelet is served with a sweet chili sauce on the side. We had the oyster version which we found to be full of flavor, though a little greasy. The oysters were surprisingly fresh and very tasty. A highly recommended stop as a way to immerse yourself into the local Thai-Chinese culture, through food. Address: 539 Phlap Phla Chai Rd Bangkok. Hours: 11:30 am to 9:30 pm. Closed on Tuesday. No tour of Chinatown would be complete without a stop for Chinese noodles and dumplings. We stopped at a small noodle shop right off one of the alleys, popular for selling freshly made noodles and dumplings. If we had not been with Context Travel we would not have known about the popularity of the place. 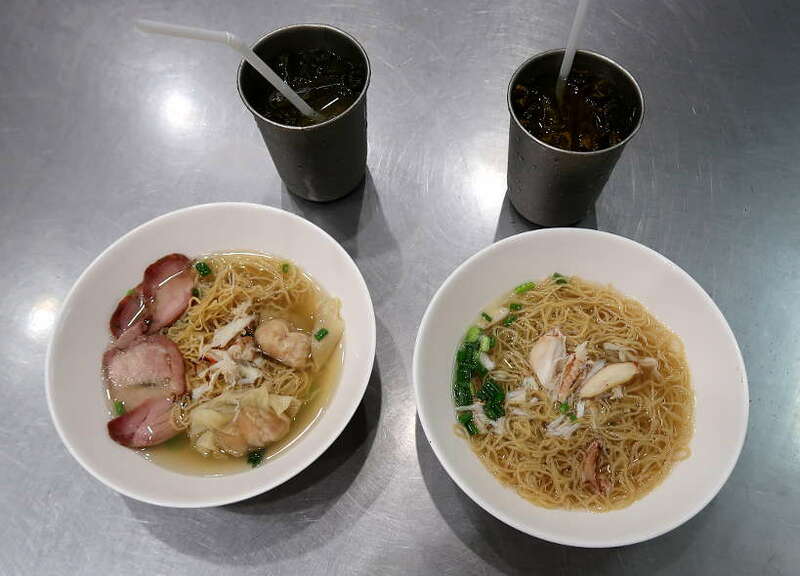 We had the egg noodles and pork soup and we also shared a side of pork and shrimp dumplings. The soup had deliciously flavorful and the pork, tender and not fatty. The noodles were thin and cooked to perfection. Stuffed from our previous stops, we could only manage to share one soup. We made sure to leave room for the pork and shrimp dumplings, which were delicious. Rosemary was a big fan of the Chinese dumplings especially when combined with the salty/sour sauce. This was another delicious stop on the Chinatown Bangkok tour! Location: 395 Yaowarat Rd, Bangkok. 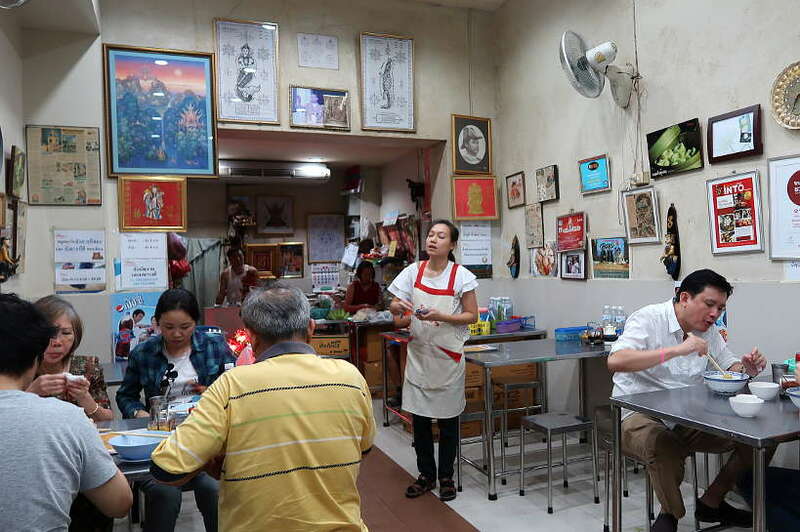 Odean restaurant is one of those unmissable local stops in Chinatown Bangkok. Although this stop was not part of our tour with Context Travel, we share it as a Chinatown street food highlight. Odean is a no-frills crab noodle shop located not too far from one of the entrances to Chinatown. You’ll find it on an unusually quiet street, offering a reprieve from the bustle of the city. The main draw to Odean are the crab claws, the egg noodles and the broth. After hearing about the restaurant from locals on an earlier trip to Bangkok, we couldn’t wait to try the much talked about crab and noodles. The menu is available and both Thai and English and the air-conditioned dining room makes for a comfortable experience. We ordered two different crab noodle dishes. One was noodles, wontons and crab in a broth, and the second one with just crab, noodles and broth. The noodles were perfectly cooked and with a great bounce. The restaurant is known for making their own egg noodles and the quality shows. The wontons were plump and the broth very flavorful. With each bite, the sweet and succulent crab meat enrich the experience. If you are hungry, note that you can order the size of the crab claw you want. To wash down your meal, try their unusual juices like lemongrass, roselle or bael fruit juice. On your way to Jek Pui Curry from the Chinatown Bangkok market, you will see the temple known as Wat Mangkon Kamalawat. 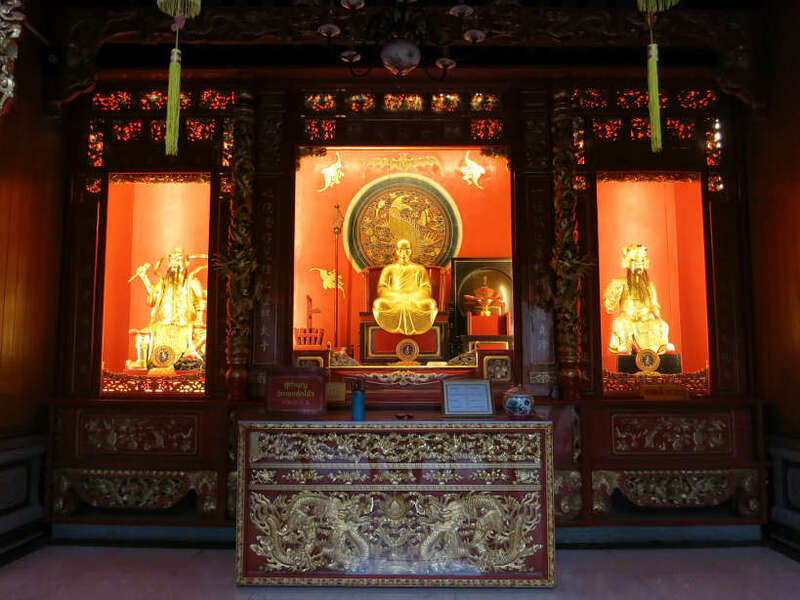 Don’t miss this important Chinese Buddhist temple in Chinatown Bangkok. 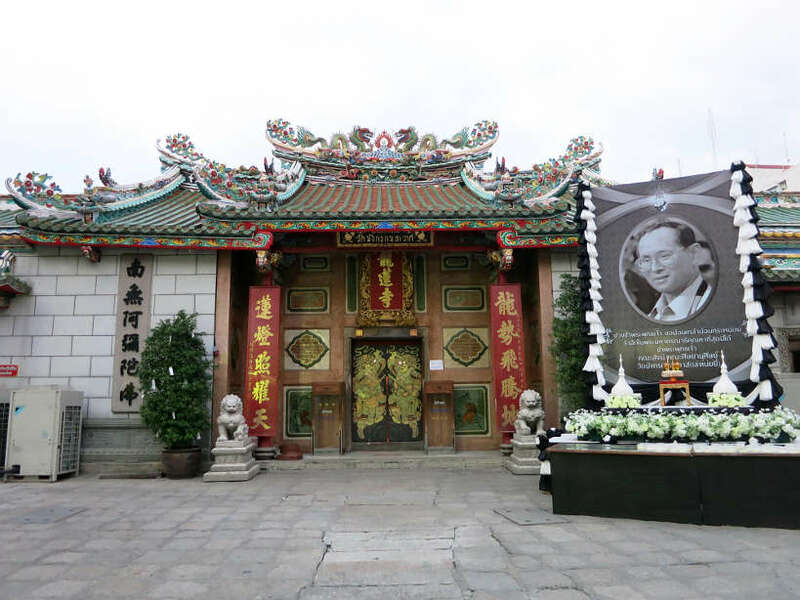 Wat Mangkon Kamalawat, known in Chinese as Wat Leng Nui Yee is the center of festivities for important events such as Chinese New Year and the Chinese Vegetarian Festival. This impressive temple is built in Chinese architectural style with wave-like roof tiles and and Chinese animal and floral designs. Inside you will many buddha images and shrines. In the principle alter, you will see Chinese faithfuls burning incense and paying homage to Buddha and the saints. The faithful believe that coming to pay homage will bring them good luck in family, business or health. Chinatown is one of Bangkok’s most vibrant districts and it is not to be missed on your travels to Bangkok. It is a great location to see the different market vendors and day to day activities, as well as the temples and rich Chinese culture and heritage. The best time to visit Chinatown Bangkok is in the late afternoon, where you can experience the two atmospheres of the district. Chinatown shops by day and the vibrant street side cuisines by night. Taking a tour with Context Travel, a company that specializes in small group tours for the intellectually curious travelers is a good idea. Our tour was private and tailored for the two of us. It was a mix of culture and historical elements, mixed together with the food culture. Having a guide that spoke Thai was a huge bonus as well. 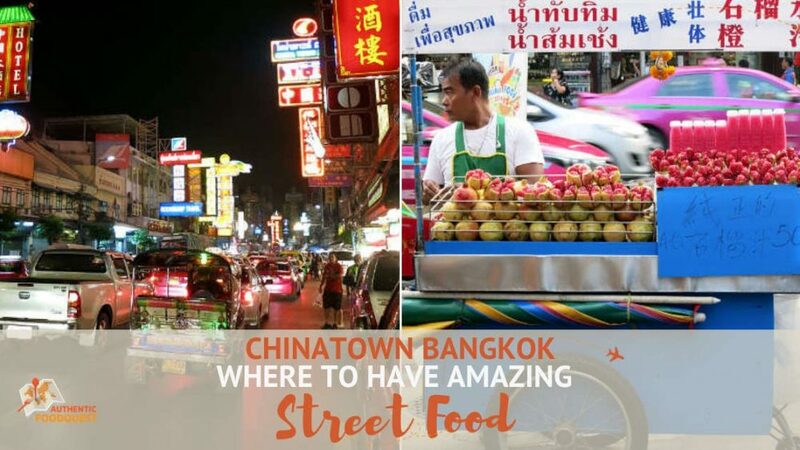 If you are planning a trip to Thailand, be sure to explore Chinatown Bangkok and the best places for street food with Context’s Bangkok food tours or any of their other tours in Bangkok. 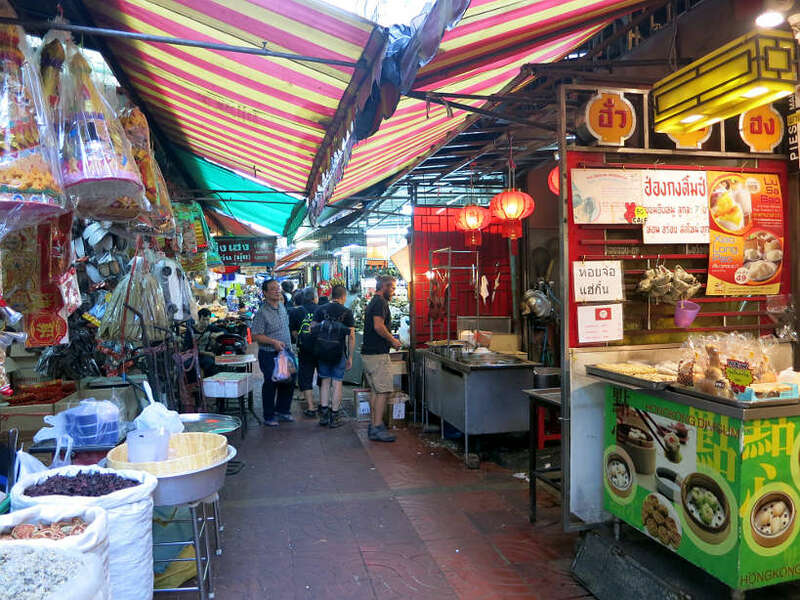 Tour: Book your Chinatown Bangkok tour directly with Context on their website Bangkok food tours. Duration of the tour: Approximately 3 hours. Bring comfortable walking shoes. Special thanks to Context Travel for having us on this tour. All views and opinions expressed are our own. Full bellies and happy taste buds too. For unique accommodations close to the food scene in Chinatown, Bangkok, book your stay at any one of these gems. Shanghai Mansion, one of Chinatown’s best boutique hotels is located in the heart of the culinary scene. 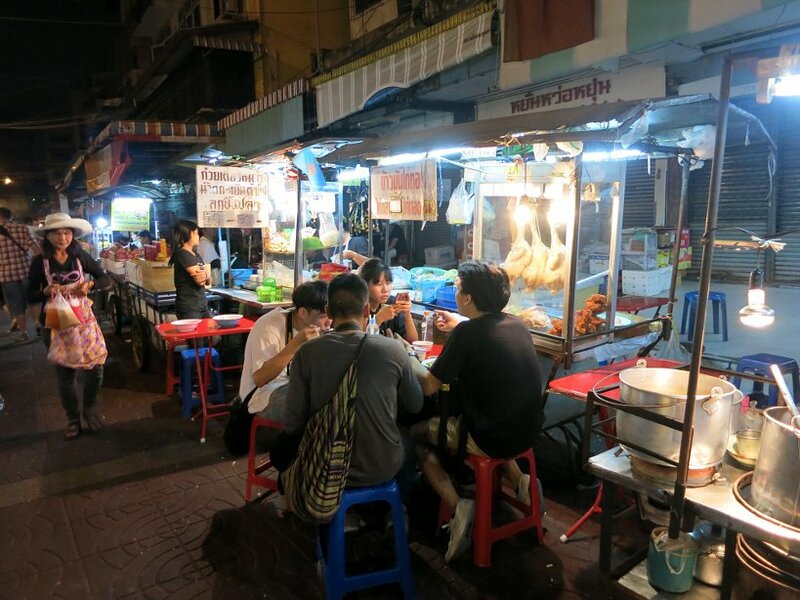 Every evening, look for countless street stalls and savor the delicious flavors all around. The hotel’s decor evokes the charm of Shanghai in the 1930s and the opulent attention to detail is remarkable. Check prices and click to book your stay at: Shanghai Mansion. Chinatown Hotel is within walking distance to some of the best street food in town. Also in close proximity is Wat Traimit Withayaram and Sampeng Market for even more local and cultural experiences. The hotel has all the modern conveniences you can expect, including free Wi-Fi throughout. You will love Chinatown in Bangkok. It is quite an experience 🙂 Glad you liked the article and please don’t hesitate to reach out if you have any questions about the food 🙂 Cheers. Chinatown was one of my favorite parts of Bangkok! I loved the hubbub and energy there. I didn’t get the chance to eat there, though, but your photos of the food are so delicious! They are making me so hungry right now. Definitely wanna eat there next time I’m in Bangkok though. Can’t believe you made it all the way to Chinatown in Bangkok and did not eat there. You are right, a trip back is absolutely warranted 🙂 Glad you enjoyed reading the article. Cheers, Lauren. Oh this post makes me so hungry. That curry and those dumplings look delicious! I would definitely take a guided tour of Bangkok’s Chinatown – seems like the best way to discover this amazing place. Thanks Claudia for your comments. 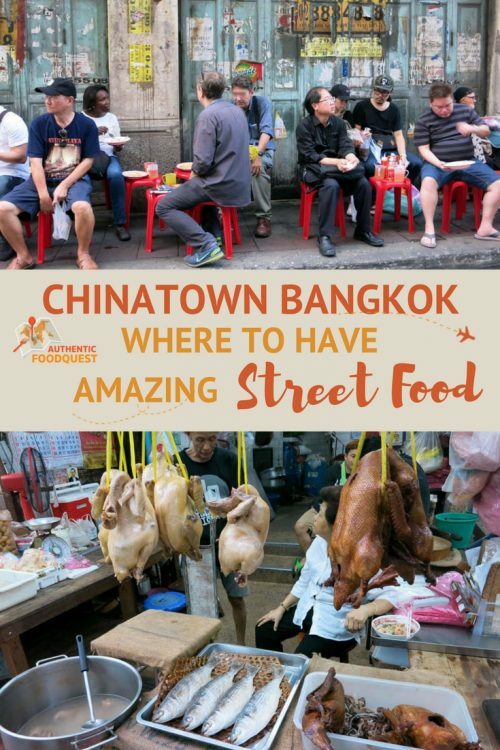 The food scene in Chinatown is quite overwhelming and having a guide to help you navigate your way is quite helpful 🙂 Hope you can get to Bangkok soon 🙂 Thanks for stopping by. I’ve been to Chinatown in Bangkok a few times but always on my own. I think a tour like this would be fantastic, because I’ve never had a clue where to eat. I just pick a place and sit down. I’d love to try the best dumplings, etc, in Yaowarat. Next trip I’ll be more organized. You are right Carol, it’s not difficult to find a great spot in Chinatown on your own. We’ve found that having a local guide can help make the experience much deeper and you will also discover places, you would otherwise not have known about. Do check out Context Travel on your next trip to Chinatown. Cheers. Thailand really is the king of street food and Chinatown is one of the best places to savor and discover new dishes! I also enjoy dumplings (preferably vegetable). Thanks for sharing these food stops, will keep them in mind when I return to Bangkok. You are most welcome Lydia. Indeed, there are plenty of delicious spots in Chinatown Bangkok. Do let us know if you discover any new delights. Cheers! 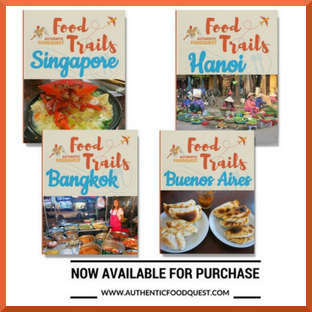 Never been to Bangkok but I have heard the best for its markets, Experiencing the market by taking a food tour sounds great. You did taste a lot of nice food! Thanks Chrysoula, indeed we did enjoy discovering and tasting the Chinese heritage in Bangkok. Hope you can get there soon and experience it for yourself. Cheers! Hi Polly, I’m sure Bangkok Chinatown has changed since you were last there. However, I’m sure it still has the same energy and character. The food was divine and worth a trip back for you in the new future 🙂 Appreciate you stopping by! As always, you two have found amazing food! The thai oyster omelet looks interesting, but I’m not sure I could eat it. 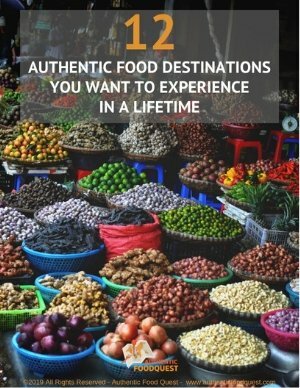 If there’s one thing I learned from your post, it’s the fact that I need to experience the food if I find myself in this area of the world. Thanks so much Sara. Indeed when traveling, one must go local with the food. The Thai oyster omelet was surprisingly delicious. When you see the flames and hear it cooking, it’s pretty hard to resist 🙂 Hope you can get to Bangkok soon. Cheers! 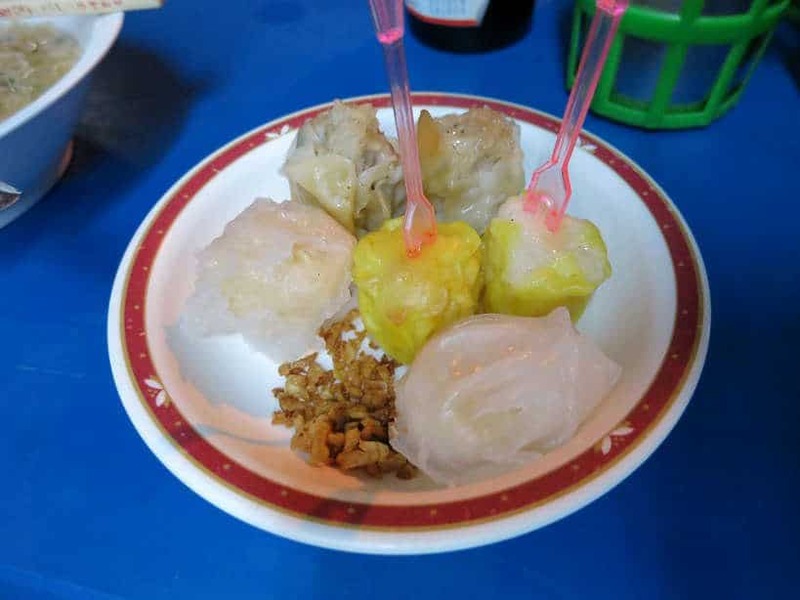 I have been reading a lot about the street food and things to try in Thailand. I hope to get there soon and taste test some food. I do hope for you Holly, that you will get to Thailand soon. The food is absolutely a delicious experience. Thanks for stopping by. Bangkok Chinatown can be overwhelming…it’s a good idea to take a guide with you on the first trip. Have you been to Bangkok Chinatown? Thanks for your comments. There is probably nowhere on the planet where I am happier that Yaowarat at night. This post brough back so many memories. Thanks. You are most welcome, Rand. Indeed Yaowarat is a special place, especially by night. Glad to have taken you down memory lane so fondly. Cheers! I have never been to Bangkok and I would love to go! There so many places I want to see and this is one of them! I LOVE trying international food! You always show so many photos to scroll through showing different places and food. We will have to enjoy our food around here and learn about the food in Bangkok. Thank you Candy and so glad you enjoy our food pictures. Hoping Bangkok is on your travel plans soon 🙂 Cheers. I would definitely take the guided tour and try all the delicious food. The curry looks amazing and all the food pics are making me hungry. Those homemade noodles are calling my name. 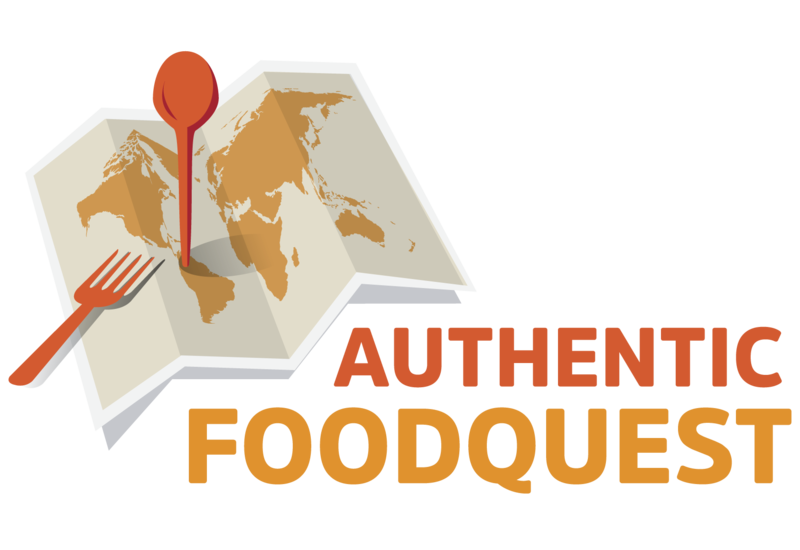 Completely agree, taking a food tour is one of the best ways to understand the local delicacies. The curry and noodles were amazing indeed. Thanks for stopping by. I just love street food, so I need to get here. This looks like such a fun area to be. I would want to try everything. 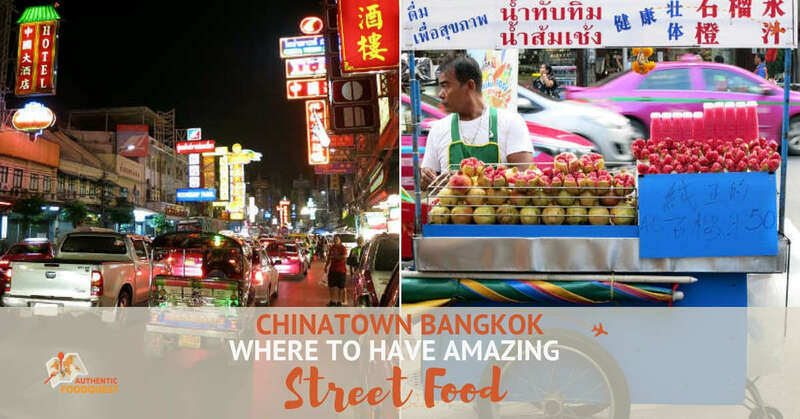 If you are a street food fan, then Chinatown Bangkok will amaze you. Hope you get to Bangkok soon!! Wow, this looks like a place my friend Cher would love. She is an adventurous eater and has been to many exotic places. I would not even know where to begin on a trip like this, so thank you for sharing your recommendations. 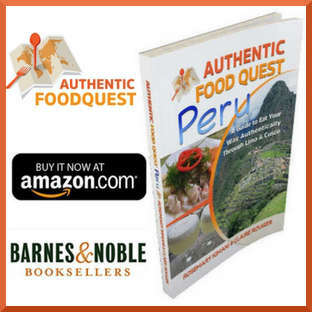 Experiencing local food is always a must on trips! Oh what a cool place to check out! 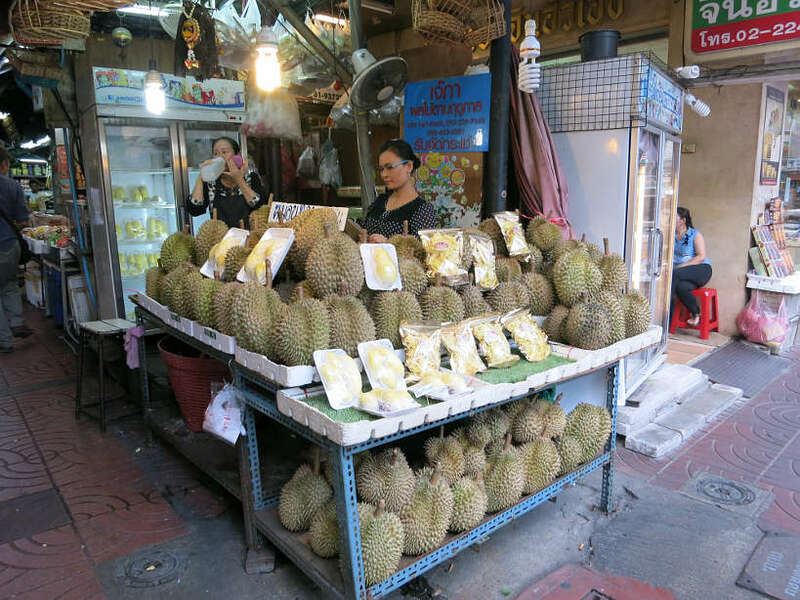 I would probably skip the market stall dedicated to durian though. 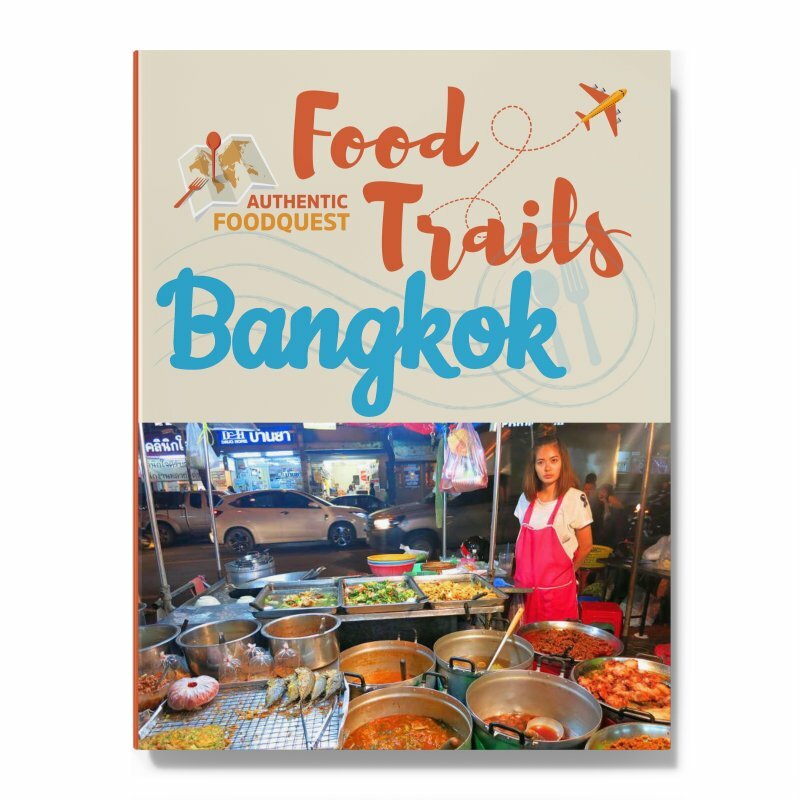 It’s great to know where to have good street food in Bangkok. 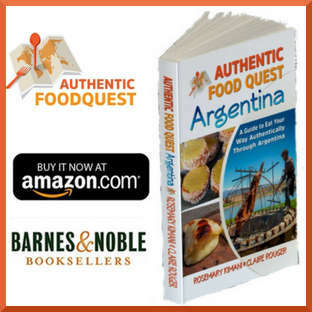 I love that you shared this information when I hear of a friend traveling here I am going to send them your way for tips in this post! Thanks Brandy. Glad you enjoyed the article and please feel free to share with friends traveling to Bangkok. Thanks for stopping by. When we travel, my favorite thing to do is find the street food. There’s something about it that makes the whole experience so much better. As China has so vast history and also the food has many great variety especially what you’ve feature here. When I was in Macau, China I always eat their fried duck and it’s so good that I keep coming back for it. I’ll have to share this with my friend who hopes to go to Bangkok later this year. She loves trying new-to-her foods and always wants to know where the best places to eat are. 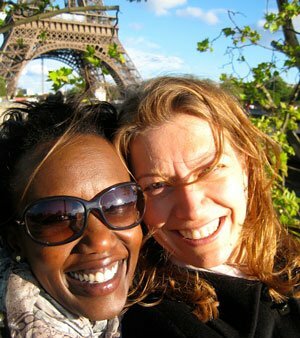 That’s perfect Beth, this article will help prepare your friend for her trip. Please do share. Thanks. 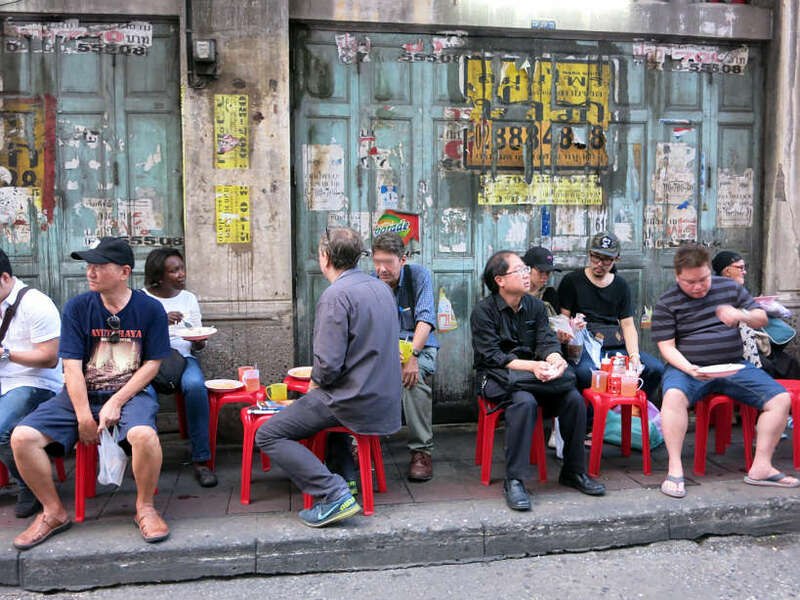 This was such a great travelogue for China’s Bangkok. I am going to give the link to my friends who will be visiting there soon. My mouth was watering as I read all the descriptions of the delicious food there. Thank you Estelle and so glad you enjoyed the article. Yes, please feel free to share with friends traveling to Bangkok. Thanks for stopping by. I would love to go there someday just for the food. Everything looks so amazing. These are such great photos! I really hope I’ll be able to visit someday. I would love to go to Bangkok and eat street food. We go to Mexico a lot and eating the street food is a part of the charm. Looking at these photos make me hungry. Street food is also big in my country, the Philippines. And I can only imagine how delicious that food is. Thanks Lyndee for stopping by. We’ve been to the Philippines and we also enjoyed the street food. The flavors are quite different, but it is all delicious 🙂 Cheers. Me and my husband love to try local street food all around the world. And I think the best place to start is Chinatown! All of that street food looks and sounds amazing! I would love to travel to Bangkok one day! Thank you for this informative and thorough travel guide. Bangkok is definitely on my bucket list and I plan to go there in the near future. Bookmarking this for later! Thanks! Perfect, Nancy. Do keep this article for your future visit and feel free to reach out with any questions. Cheers.